Referee Jeremy Simpson was villain of the piece as Leeds United were denied victory at home to Brentford. Brentford were gifted a controversial penalty and Leeds ended with 10 men with Luke Ayling’s injury-time sending off while the decision making on fouls and bookings was inconsistent at best from an official who was constantly jeered by home fans with their chants of “you don’t know what you’re doing”. But with many things going against them United kept going to hit back after the visitors had taken the lead with their spot kick and thoroughly deserved the point they earned from Pontus Jansson’s 89th minute header. It was fitting that Jansson should score the equaliser after another towering display from the Swedish centre-back who is right back to his best form. Too many of his teammates were off their game in the opening half which ended goalless but could have seen Brentford take the lead several times. It was a different story after the break when the Whites dominated and missed a succession of opportunities before their late leveller and they could feel hard done to in the end. But the opening half saw home keeper Bailey Peacock-Farrell get fingertips to a Neal Maupay shot to divert it wide. He made a more comfortable save from Sergi Canos’ low shot and Maupay sent a shot wide from outside the box. The only Leeds response at this time was a Mateusz Klich shot from 20 yards out that went wide and a Tyler Roberts strike that was well saved by Luke Daniels. Brentford were inches away from taking the lead in the 28th minute when Ollie Watkins’ shot deflected up onto the crossbar. The rebound fell to Maupay, but Peacock-Farrell did well to close the striker down and make a block. Leeds improved close to half-time and carved out a good opportunity when Ezgjan Alioski’s pull back found Samuel Saiz in space in the box, but the Spaniard sent his shot inches wide. The second half saw the Whites on the back foot again initially when Alioski gave the ball and in trying to cover for him Jansson was adjudged to have fouled on the edge of the area. Canos’ shot from the resulting free-kick went wide, however. Jansson went close with a header from Leeds’ first corner and Kalvin Phillips was denied by the keeper from close range, but they then fell behind in dubious circumstances. Liam Cooper lost the ball near his own area, Maupay attempted to put Watkins clear and he went down under a challenge from Peacock-Farrell while shooting wide. Referee Simpson pointed to the spot, although replays showed there was minimal contact. The upshot was a booking for the Leeds keeper, a goal from Maupay from the spot and much verbal abuse from the home fans directed at the referee. The Leeds players did not let it get to them, though, as Cooper headed a good chance wide from a free-kick and Roberts’ near post shot went just wide. Watkins’ shot from the edge of the box was saved at the other end by Peacock-Farrell. Lewis Baker sent a free-kick just wide with his first touch after coming on as substitute and United were finally rewarded in the 89th minute when Jansson headed home Alioski’s free-kick. There were only four minutes of added time despite stoppages being much longer than this, but there was more action to come as Baker’s glancing header went wide and the hosts went down to 10 men with Ayling red carded for a second bookable offence in the eyes of the official. 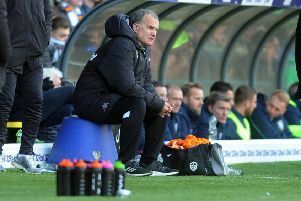 Earlier he had let Brentford full-back Moses Odubajo off for a bad lunge after he had already been booked, giving Leeds fans more chance to vent their feelings and allowing visiting manager Dean Smith to substitute his player. The referee then played an extra minute to allow Brentford a final attack, but it came to nothing as the match ended in an eventful draw. Head coach Marcelo Bielsa thought a draw was a fair result. He said: “We could have won the game, we could have lost the game. But it would be fair to say we came close to winning. “It is very difficult o play against Brentford because it’s how they use the ball. All the players feel at ease with the ball. “We didn’t dominate the game, but were not dominated. The game had many unpredictable situations. “The necessity to impose our style made us take excessive risks. We chose to play from the back, but we made many mistakes not because of the opponent but because of the way we were trying to play. When asked about the referee, Bielsa refused to have a go at him. Leeds: Peacock-Farrell, Ayling (sent-off 90+4), Jansson, Cooper, Dallas (Clarke 70), Phillips, Harrison, Klich (Forshaw 63), Saiz (Baker 76), Alioski, Roberts. Brentford: Daniels, Dalsgaard, Konsa, Mepham, Odubajo (Barbet 76), Moketjo, Yennaris, Sawyer, Canos (Benrahma 76), Watkins (Judge 84), Maupay.